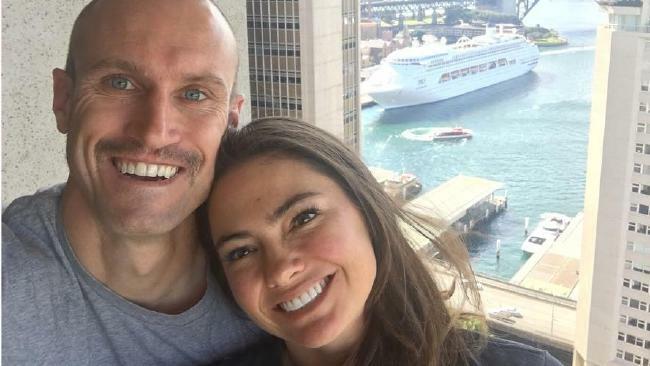 Fitzy with his wife Belinda lost a child in their first year of marriage. HE'S the radio funnyman known for waking Sydneysiders up as one half of breakfast radio duo, Fitzy & Wippa. But alongside his gruelling hours behind the microphone, Ryan "Fitzy" Fitzgerald is also the proud father to two healthy sons, Hewy, 8, and Lenny, 4. This article is based on extracts from the Balls Deep podcast series, a production by news.com.au. For the full episode with radio host Ryan "Fitzy" Fitzgerald, listen to the podcast below. You can subscribe to Balls Deep on iTunes. After getting married 10 years ago, Fitzy and his wife Belinda experienced indescribable grief in their first year as husband and wife. The radio star and his partner Belinda, were expecting to welcome a little girl into their lives in 2008 - but instead their moment of happiness turned to heartbreak. "We've been through quite a bit with our relationship," Fitzy told news.com.au's Balls Deep podcast series. "We lost a child, which was pretty full-on. I came from a family that's like, you get dealt a bad blow and you move on. But she [Belinda] came from a family that was quite emotional and it was pretty full-on." 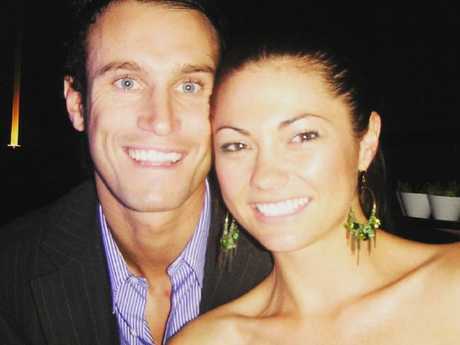 Fitzy with his wife Belinda experienced heartbreak in their first year of married life together. Fitzy said his wife wanted to see their daughter, Cayley-Jay, after she was born - a recommendation from doctor's he was initially against doing. "Unfortunately she (Belinda) had to deliver her," he explained. "It was tough … and I haven't really spoken about this much. But they [doctors] think the healing process is that you should see the baby, and I said 'no she's not going to see the baby' because she will be traumatised. Fitzy and Belinda celebrated their 10-year wedding anniversary this year. 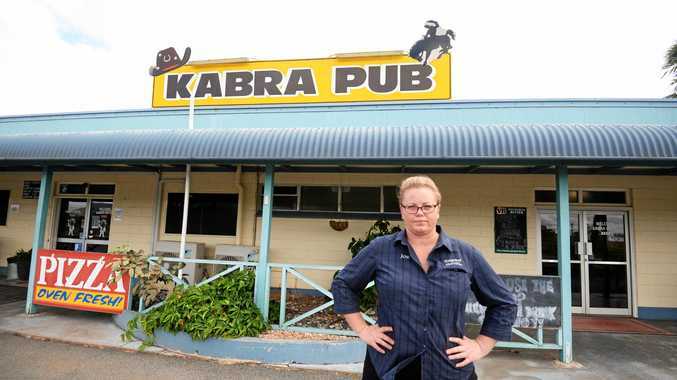 "(Belinda) said, 'Honey I think we should do it' and I said, 'No I think this is ridiculous I think we should move on and forget about it'. "[But] she delivered the baby and she decided to do it and it was the best thing that we ever did. "We had closure … to say hello and say goodbye to Cayley-Jay. It was hard … but I think it definitely helped with us getting over that moment." Belinda with her children Lenny and Hewy. More than 2500 babies are born still in Australia each year, which equates to six babies delivered still in Australia daily. That's one family every four hours. 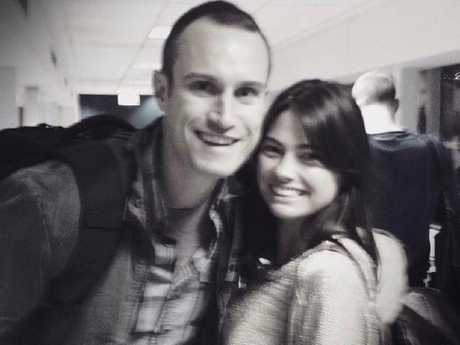 Fitzy said the heartbreaking experience brought them closer together - and the pair decided to try for another baby straight away. 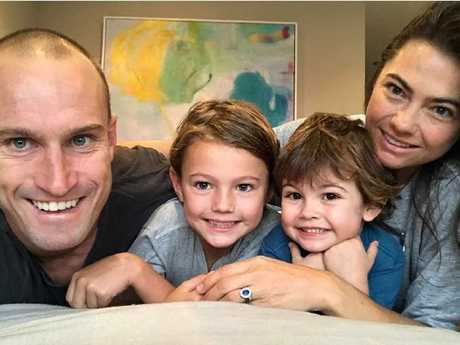 Fitzy with his young sons Hewy and Lenny, and his wife, Belinda. "We tried straight away and Bee Jay got pregnant straight away," he said. "We wanted children, and you're quite fertile in that situation. "It makes that first moment so special. When we had Hewston, it was very, very emotional. "There's so many people who can't have children so we were very lucky." Listen to Ryan 'Fitzy' Fitzgerald's full interview now on Balls Deep. Listen to and download it on news.com.au or iTunes.